I have a confession to make. As the editor of FaveQuilts.com, I am often spoiled rotten. I get to see all the new quilting technologies coming out (yes, quilters do love technology), receive fabric bundles in the mail (jealous yet? ), and sometimes I get to go on free trips just to check out quilting events. This was one of those weekends. 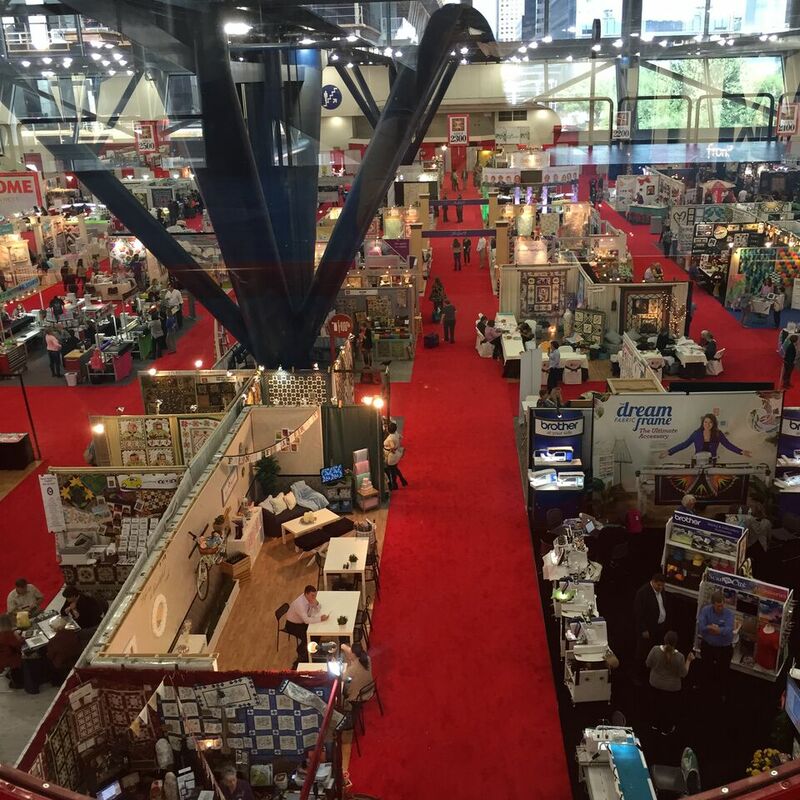 On Saturday morning, I embarked on a journey to Houston, Texas to attend International Quilt Market 2015. If you have never heard of International Quilt Market, it is an international trade show where quilters, fabric companies, and other quilting-related businesses get together in one HUGE convention hall, the George Brown Convention Center. Absolutely and seriously huge. Look at all those booths! 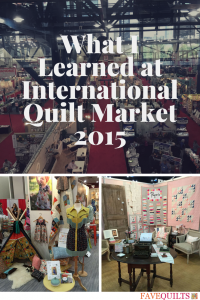 You may be wondering why exactly we headed to International Quilt Market 2015. Well, dear readers. We took the trek to Houston for YOU! This super fun and a little exhausting trip gave us a chance to connect with companies big and small to co-ordinate giveaways and find some brand new patterns. We have some exciting things coming your way. Stay tuned, readers. It is going to be a very exciting year. Be sure to scroll down to comment and enter to win a fabulous swag bag! You can put just about anything (or anyone) on a quilt. Seriously! Quilting and technology go hand in hand. 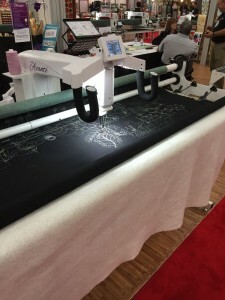 From brand new quilting apps (you heard me) to long arm machines that FMQ on their own, technology is totally making its way into this old school art. Fabric companies have some incredibly adorable style. Check out some of our favorite booths! How much do you wish these little set-ups were your home? There’s some very exciting fabric lines coming your way this year…. including Star Wars! 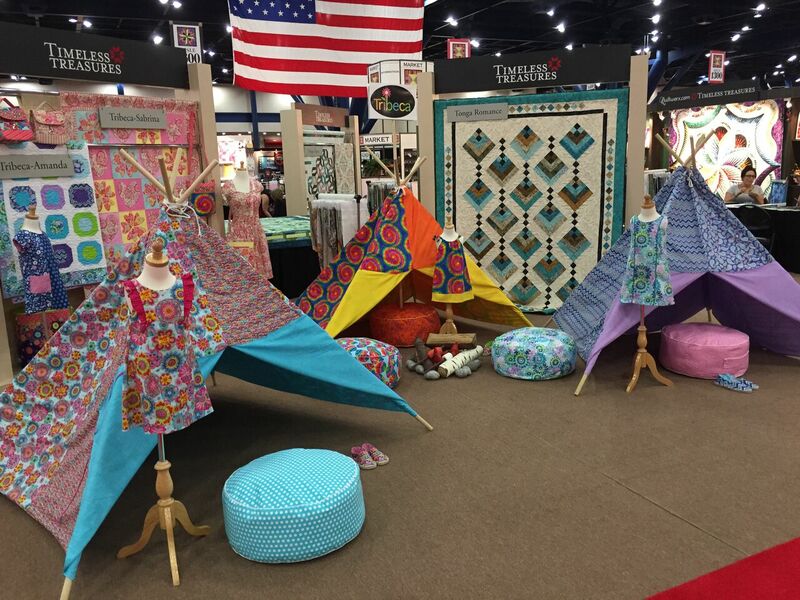 Traditional, old school, Native American-inspired, and country quilting fabrics, designs, and projects are crazy popular. We saw SO many fabric tee pees! 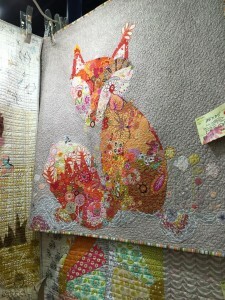 Quilters love… in no particular order… owls, elephants, and foxes, oh my! These animals just kept popping up in booths and designs. I’m not complaining! 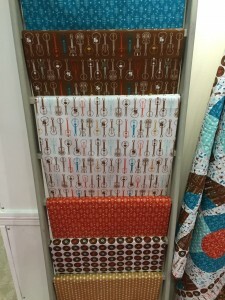 Quilt Market 2015 was a very exciting adventure and seeing what’s coming out in the next year or so is incredibly exciting. From new fabric lines to upcoming trends in design and technology, the quilting world is in for an exciting year and we’re thrilled to be a part of it. The editors here and FaveQuilts.com and SeamsandScissors.com felt a little guilty about having such a fantastic experience and want to share it. That is why we are giving away this very exciting swag bag. There’s so much in this prize that we’re not going to list it all…. just check out the picture! This giveaway has ended! Congrats to Shirley, our winner! What kind of quilting patterns are you looking forward to making this year? I am going to make quilts that I love! Maybe some to give away, some to teach my grandchildren to quilt, and some for fun! I also went to the quilt show in Houston and came home excited about making an English paper piecing quilt using 3/4 inch hexi’s. Had a blast! 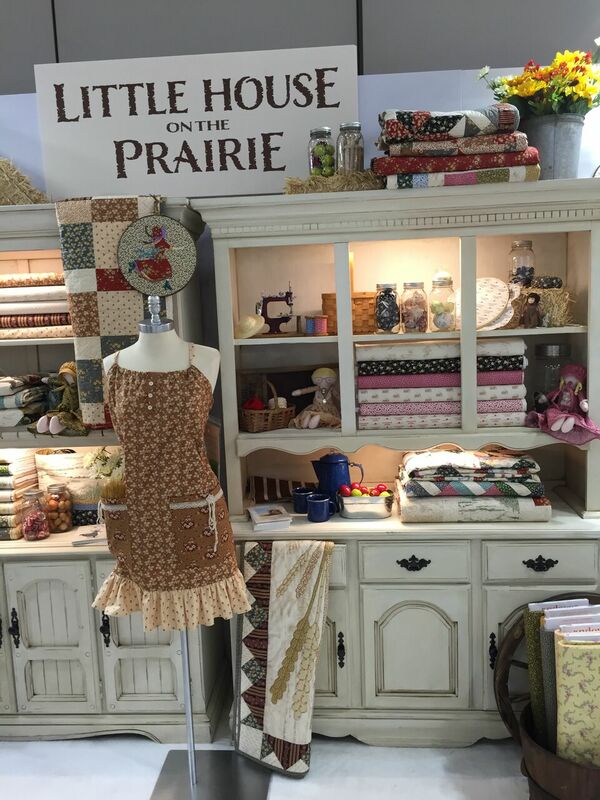 I really like the Little House on the Prairie fabric line and the patterns that go with it. Can’t wait to see it in the quilt shops. Thanks for the generous giveaway. I’m looking forward to more of Tula Punk’s patterns and fabrics. Also am planning to make hay it’s quilt’s gravity quilt. Anything with bright colors works for me! I love Block of the Month quilts. I love personalizing the quilts with my own colorways. It’s also nice to have structures and deadlines in order to get it done. Thank you for this opportunity to win what looks like a great package. I’ve recently retired so after the holidays I will be doing a major cleaning in my sewing room. I’m sure I’ll find boxes and bags of leftover fabrics to dispose of. Being someone who hates to waste, I have a folder of several scrappy quilts I plan to make. I belong to a large Quilt Guild that donates to two homeless shelters so I know my quilts will find someone who can use some extra warmth and know that somebody cares about them. I love anything with stars. Maybe it comes from watching the night sky, it’s amazing what goes on out there! People can be stars too. I just love the analogy of any bright star, no matter who, what or where it is in your life’s journey. Looking forward to some relaxing hand applique quilts this year! I plan to make simple, happy quilts with bright colors. I love to quilt, it allows me some quiet time to not think about work and other things. I am so looking forward to retiring at the end of this school year and being able to spend more time quilting and trying new techniques. I love making quilts for my family and friends. I need to learn more about doing applique. I look for patterns that are quick or easy but look complicated, with lots of detail. I just want to make quilts!! I’d love to have a on-going pattern inspiring me to keep up with the process. (i.e. a Block of the month/week). Good if the project was sizable for lap/twin/full/queen to meet any need. A mystery quilt would be an option, too. 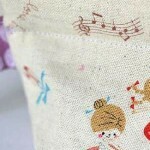 Especially interested in seeing an idea like this with opportunity to use various fabrics (fat quarters) from my stash. Thanks for the swag bag winning opportunity! I am planning on making me son a valor quilt and then I would like to make the post card quilt I saw in one of my quilt books. With so many beautiful fabrics and designs I’m going to have a tough time deciding which ones to use for my new grand babies! I love the look of traditional quilts so that will be my focus. I am going to make ME something this year. I have only been making quilts for a year or so, but have made several GIFTS for others, and this year, I am hoping to find that one pattern that sticks out for ME!!!! Plus a few gifts here and there! I would love to win this!!!! I am semi retired, working 5 part time jobs to make the budget work (and give me a little money for fabric!) Quilting is my treat for me in the making, and gifts for our family in the giving. 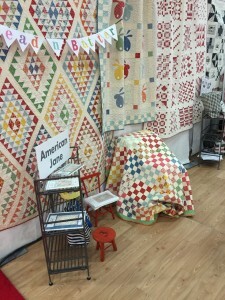 I loved the look of the American Jane quilts in your pictures. I probably will never be able to buy all of those wonderful goodies… It would be wonderful to win them. Thanks for the chance to! I plan to finish some of the quilts that I bought fabric/kits for at the Quilt Festival in Houston TWO YEARS AGO!!! It was a fantastic experience, and I would encourage every quilter to attend!!! I’m looking forward to making some new organizing baskets for my sewing space. I love to make the outsides a fun quilted design. I have recently moved and had to downsize considerably, so I need to spruce up the new space! 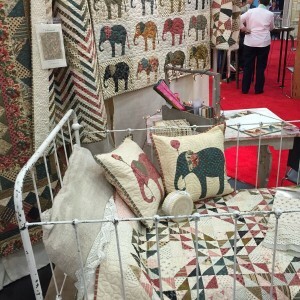 The Houston international Quilt Show and Festival were so awesome that I can’t imagine how wonderful market was. I’m envious! I LOVE the way we show the creativity God blessed us with! As a fairly new quilter I am looking for patterns for scrap quilts so I can use up a lot of the material pieces I have left over from various projects. Enjoy your website but have had difficulty sometimes trying to download the free patterns. 1 Mickymouse theme….1 twisted sister…… A patriotic theme…finish a gingerbread people I have started and I am loving the mug rug Idea…so scraps will turn into those for gifts for next Christmas…..gonna be a busy year!! Love, love the Santa Owl. Would love to make it. I am going to make scrappy quilts and promise to make a dent in my stash! I keep saying that-maybe someday the pile will go down. I love your emails and would love to win this adorable bag full of goodies. I am so looking forward to seeing more ideas from you. it is my favorite pastime to take a cup of coffee and look at all your ideas and patterns. I have always wanted to make a compass rose quilt and this year I found a paper piecing pattern for one. Have the all the material already cut and waiting for my next day off to get started. Love the pink and gray color ways. My 8th grandchild is on her way and she wants lots of new things in just those colors. Have been working on making a quilt for each of the other grandchildren too so have lots of opportunities to shop for new and use the stash! I am going to challenge myself to make a modern quilt using appliqué, thread painting and traditional quilting … Can’t wait. 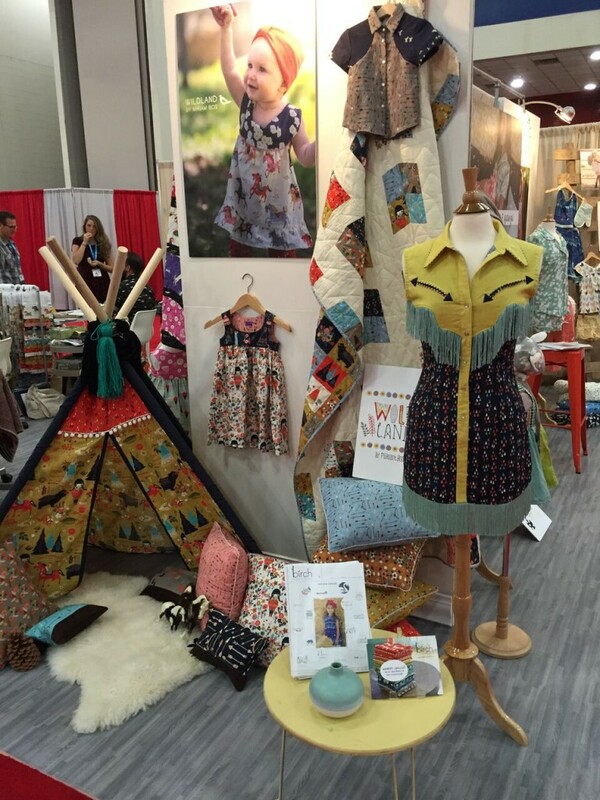 Love peaking at the new quilt designs coming our way this year! I want to make a really great Christmas quilt. I am still looking for the perfect pattern. I’m doing simple, patchwork quilts for my boys’ bunkbeds – and it’s been a challenge to find similar color schemes but different themes (I want the room to coordinate in regard to color, but I want each of the boys to have a theme that means something to them…one is a sports nut and one likes Legos and video games). I’m also doing a college-themed quilt for my oldest daughter out of minky, microfleece and flannel. I will be making several baby quilts this year for a friend and several family members, I am the aunt & great-aunt that now makes the quilts for the family since my aunt mae passed away this year. It is so much fun. I am new to quilting and have been making simple cute animal quilts for my grand kids. My husband has a project for me and I hope to start that challenge(making a quilt using the cut out logo’s from a a whole lot of certain liquor bag). Thank you so much for sharing the pics – made me almost feel as if I were there! I want to try paper piecing in the coming year. I know it will be a challenge but there are so many good resources to go to for help. 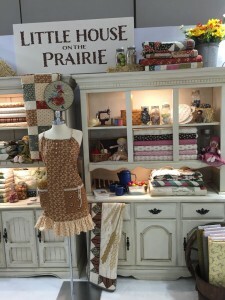 I want to try the new Little House on the Prairie line of fabric – they are fabulous! Again, thank you. Colorful quilts. I love intricate patterns or those that look intricate. I also want some quick and easy patterns for baby quilts and charity quilts. Elephants rock too!!! I love the traditional quilts but also like Eleanor Burns patterns. I have always wanted to make her Tennessee Waltz quilt and even have the fabrics for it. I can’t wait for the Little House in the Prairie fabric. I have downloaded the free patterns but haven’t decided yet as I want to utilize as many of the fabrics as I can. My sister was a fan of the books and show when she was little and I think she will love this! I’m also taking a class with Susan Carlson – doing her Serendipitous Sea Turtle and I can wait – although I am terrified just thinking about it. I also have 5 Downtown Abbey quilts to make but I haven’t settled on a pattern yet. I have always wanted to make a crazy quilt with all the fancy stitches and lace. I’d love to do an owl quilt next year! I will be attempting my first wall hanging for the 2016 holidays! This would have been awesome to attend, unfortunately my disability prevents me from leaving the house very much. So needless to say would love to win. I am finishing a large project of baby quilts for donation to the local children’s hospital. There are 37 finished of a goal of 52. Most of them are designed to fit the available fabric–I sketched a new idea yesterday and am longing to get to my machine and make it a reality. Smaller projects this year. More traditional looking fabrics. wow, this looks like you had a fabulous time. It is always fun to have learned things while on ventures like this. I am looking forward to a lot of paper piecing this new year for around the house. Pillows, placemats, etc..
I’m really excited to start collage and art quilts and do some fun funky & modern LAQ’ing on them! I’m going to make quick and easy quilts from my stash to donate to Snuggled in Hope. Then I can go fabric shopping and start again! As I prepare to retire September 30th I am taking time to look around my quilt room and seeing all of the things I’ve amassed since I started quilting in 1996. I have five mystery kit editions from Glad Creations in Mpls MN. Beautiful fabrics included in these kits and Gladys created beautiful patterns to compliment the fabric. This will be my first pile to tackle, at my retirement leisure. I have just started quilting, and I love it! So far I have made some totes, wall hanging, table runner and baby blanket. Each time I sit at the machine and look at fabric all I can think about is what can I do next? I Hope to make a Bargello bag and quilt for a friend. I am a beginner quilter and I love learning everything about quilts and the history of them . Right now my project is making baby quilts to donate at local hospitals and lap quilts for homeless shelters. I want to tackle a log cabin and a t-shirt quilt. I wish someone would have a quilt workshop/show in our area; Aiken-Augusta. Awesome giveaway. This year I want to make some quilts that I’ve wanted to make for a long time: Sunbonnet Sue, Irish chain, a modern Owl quilt,a scrap quilt but I usually go with the mew patterns Just out. I am trying to expand my quilting skills by first of all being more careful with my techniques and also in my accuracy. More difficult patterns are in my future – I love the journey of making a quilt and am always sad when it is done. The new fabrics and toys that come out each year are exciting and continue to feed my addiction to quilting. I want to try my hand at applique! This year I’m hoping to challenge myself with new techniques, love the crisp look of paper piecing so hope to make a scrappy sampler to learn something new and hopefully put a little dent in my stash. 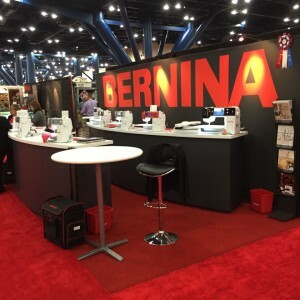 I was at International Quilt Festival in Houston, just got home last evening, Had a wonderful time, spend a bit of money (alot really) saw some great new things and I am so excited to see all the new things my local quilt shops will have for me in the coming months.. I am so inspired by all I see. I’m 58 and just went to my first ever sewing retreat. I am now hooked!!! I want to make a log cabin quilt this coming year. I am so excited to now be a part of this incredibly talented artistic community! Thank you for all the sharing from everyone!! I would like to try making a quilt using hexagons. I just think they are so beautiful. But since I’m a beginner quilter, I think they would also be a challenge. I have been making more wall hangings of less traditional designs, more paper pieced, more complicated (for me) and using variable low volume (usually) backgrounds and variable prints for the subject. Ala Ruth McDowell and Ann Shaw for example. Thanks for the great offer! I am interested in learning how to quilt. I am a crafter on several areas. I want to add quilting so that I can make quilts for my family and friends. I’ll be tackling a t-shirt quilt and I have not been brave enough to learn how to free motion quilt…maybe this year! I’m a sew-ist of many years and just entering the world of quilting. What fun it is to explore a new horizon. I love using the 9-patch in varying ways to get so many different looks. Looking forward to mixing it up. I am going to challenge myself to do a “twirling fans” pattern. It involves techniques I have not yet done. I am super excited!! The quilt I will be making next is a “cowboy quilt” for my husband’s 60th birthday in July 2016. It has cactus blocks, cowboy hat blocks, boot blocks and a border with a lariat on it. The back will have a border also with sheriff’s star badges in the corners. I have collected way too many fabrics for this quilt! Anyone else need to make a cowboy quilt??? I am hoping to make some paper pieced patterns as well as a log cabin quilt with appliqued butterflies and other patterns (whatever else strikes my fancy and for which I have the time). Patterns for precuts! Jellyrolls, layercakes etc. I have collected a lot of them and it is time to use them. I would like to see some ‘woven’ or puff quilt options for small projects. I would like to renew memories of my now grown daughters by making a quilt from the Little House On The Prairie fabrics for my granddaughters. thank you for sharing the wonderful photos I hope to go to the show next year. Need to start saving right now. I will be retiring soon and upping my quilting game! I like to make quilted projects for gifts large and small. My next project is going to be a baby quilt for my new grandchild. Reading about Quilt Market was euphoric! Right now I am interested in quick, basic quilt designs that can be sewn quickly and used for children’s charities. They will be small, about 36 inches square or slightly larger. Photo memory quilts. I also like making scrap quilts. I am a real newbie. No one I knew before I started getting excited about quilting was quilting. I now have a couple other friends that do now and one even purchased a long arm! I am going to try a block of the month or else the 1930s book of samplers. I am not sure as I have been following and they are not necessarily for the beginner or novice quilter like my self. It would be so fun to win. Thank you for informational news from Houston. It is a trip I would one day love to make. I am looking to use traditional patterns in new ways. Log cabin is my favorite design. One of the reasons I love it is because there is such a variety of settings. In 2016 I want to make a log cabin quilt with a modern twist. I will be making more quilts for my grandchildren. Most likely the favorite animal for each child. I will also be doing some Eleanor Burns and Jenny Doan quilts as well because they are easy to do and so beautiful. Will also be doing quilts for victims of the Valley Fire in California. 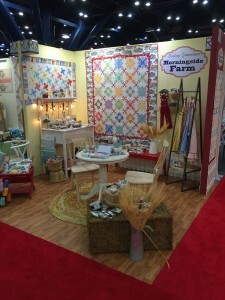 Ohhhh to wander the halls and visit the booths at quilt market! Fun fun. I want to make several baby quilts this year so I have some made to give as gifts. I really would like to try a quilt with circles. I received a circle cutting tool as a gift and would love to try it out! I’d love to make a “bookshelf” quilt. I am currently working on a double Sun Bonnet Sue (applique) quilt for my beautiful daughter…it’s taking a bit longer than anticipated but I want it to be perfect. While I am working on this quilt I am planning my next quilt…the Lasagna quilt (King). I am going to put a twist on the Lasagna quilt by ragging it in 5″ strips which runs the width of the quilt. It’s going to be awesome! I have to plan each quilt in advance since I live in an isolated area and all my quilting requirements have to be ordered and shipped via the post. Matching fabrics can be challenging but I love this art! I really want to make a memory quilt out of the old baby and kids clothes from my two sons. I collected the most treasured shirts and pants and sleepers the last 6 years. So now it is time to finally DO it! I also want to make a Jane Austen quilt, but I am still searching for the vintage fabrics. Thank you for sharing all the inspiration! And for the chance to win these awesome looking bundle! I am a newbie at quilting and would be like a bull in a china closet to be able to go to one of these shows. I love making lap quilts. A friend and I have stated making them for the cancer center here in town. Keeps them warm thru their chemo. I also like making mug rugs for my friends. Am saving T-shirts of places where we have traveled to so that I can also make a quilt out of them. Have seen so many beautiful quilts that I would love to learn how to make. Not sure where to begin. I am just learning to piece quilts. I hope to get the hang of it and make a bear claw quilt as I have always admired them. My husband went with me to the Quilt Festival this year & he really liked the landscape quilts. He has asked me before to make him a “picture” quilt involving the river & fishing (his favorite hobby.) When he saw all the different methods in the show quilts, he told me to remember everything I saw to do his with. So I guess I will have the goal to do it for him since he braved the weather on Saturday to drive me to Houston. LOL! I found favequilts.com about 4 years ago. It’s been my go-to place for quilting. I do wish more patterns would give measurements for multi-sized tops. I’ve always quilted by hand (self taught) until 2 months ago. I sold a calf and used all the money to buy a gently used mid-arm quilting machine. My 3 kids, 1 step-daughter, and 4 grandkids are getting quilts for Christmas. Just finished a quilt for my Iraq-combat veteran son in law’s birthday! I am a recently retired nurse and have decided to try quilting. So far I have taken 1 class and have made one quilted throw plus several small projects. I know I have a lot to learn and still need a lot of supplies and ideas. I have always loved to sew but the last several years have not had much time for my hobbies. Now I am looking forward to trying new things. I am new to quilting and have just used beginner patterns for 17 Christmas quilts for my family. I am so ready to move to intermediate patterns and love anything hexi! Using gray background/sashing is another must on my to-do list. 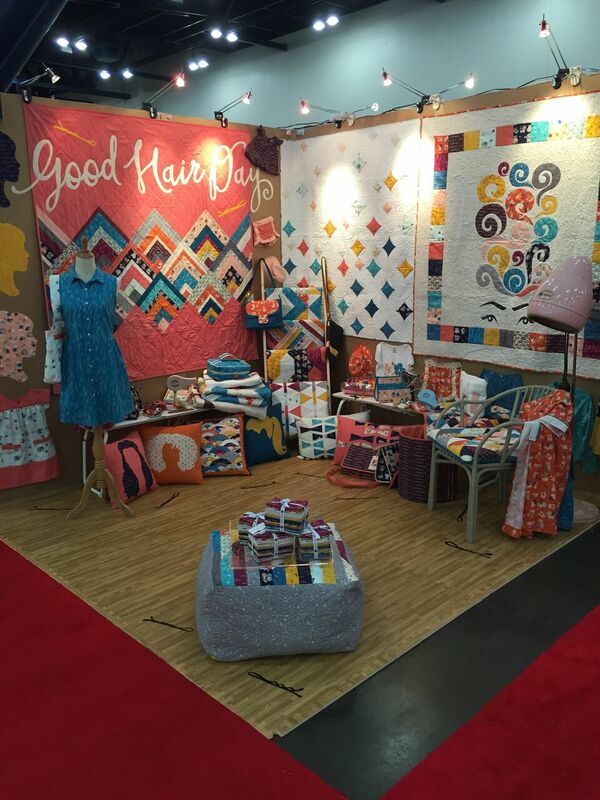 Quilt Market looks amazing! Thanks for the great give-away. Going to the Houston Market is on to do list. I love to see all the new fabrics and patterns and gadgets that are available to us. I love to make quilts for my family. I like all patterns cat related. I’m also looking forward to new patterns that use Quick Curve Ruler by Sew Kind of Wondeful. Really interesting patterns can be made with this ruler. Colorful quilts make me feel happy, so I incorporate as much color into my work as I can get away with. I am always looking for new and unusual fabrics, often whimsical in nature. I quilt all day long, so i need to sell most of my quilted items- a larger home is out of the question! However, I am looking forward to gutting my sewing room to make it more organized and space friendly. I am also looking forward to doing some more challenging quilts for myself this winter, as 95% of what I do is sold at Christmas craft sales. I am always thrilled when fabrics don’t work out for quilts because I use all the fabric that “didn’t quite work out” to make dresses for girls all over the world through a charity called “Dress A Girl Around the World” International program. All you quilters out there who want a good home for your “unfavorite” fabrics, find a local chapter of DAG- they are always looking for donated fabrics. I am looking forward to making a kit i got at festival of a childs quilt the says I love you to the moon and back from Kit and Cabodle. It is so cute, I also got a kit of their grow chart that is darling. Festival was wonderful, so many ideas and tools, but I am totally exhausted after 3 whole days there. I hope I win your tote, thank you for donating it. Just two of the quilts I plan to work on next year are Jackson Hole by Emily Herrick and the Farmer’s Wife 1930’s quilt. Your examples of new quilt trends utilizing some tried and true techniques, patterns, or embellishments from previous eras is exquisite !! I am looking forward to making 2 kits i bought at festival, one is I will love you to the moon and back. Had a wonderful time at festival, so much to see and love, but exhausting after 3 whole days. Thank you for donating and I hope i will win….. I am hoping to get through the Farm Girl Vintage book by Lori Holt. I am going to “attempt” a POTC quilt. Also designing my own pattern to include squares, rectangles, diamonds and hexagons. I have a lot of excess scraps I want to use. I plan on making a Dresden quilt as well as A Walk in the Park. Love your blog! More tools! I am about to start hand quilting a mini thimble quilt I cut out several years ago, all 1400 plus pieces! I like the disappearing nine patch and think it might be fun to combine with the. 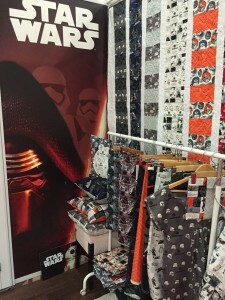 New Starwars fabric. My grandsons and son are all into the old and new characters! I am just getting back into quilting after an hiatus of about 15 years. 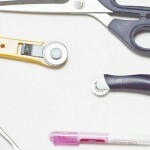 I am dying to try my hand at paper piecing! I am going to make baby quilts, baby bibs and receiving blankets for my FIRST Great Grandchild, maybe if I can find a Bargello pattern to do so, would be great! Want to do a Bargello and think a baby quilt would be a perfect start for that pattern! I want to work on my husbands special quilt. This is a Quilt of Valor for him and more. I started last year and it has been a bad year for our family. He suffers for PTSD and is still very much an American solider even though he is retired. I am working on putting all his patches he earned on his quilt. He loves the USA and the military. I will also be placing and embroidered Eagle with the Pledge of Allegiance on the front. He was a Dustoff Helicopter Pilot and his job was to fly into hazardous areas to pick up the wounded soldiers. I want to thank him for his job in the Army and for all the lives he saved, many we are in contact with even today. He is a Vietnam Vet and they did not receive the thanks they truly deserved. I think you should win. Just read all of the comments, and your husband deserves our gratitude and plenty of thanks. I should have added thanks to you too, for being his back-up. It could not have been easy to wait for him to return. I’ve sewn clothes for years but have never made a quilt. Its been on my mind for awhile now. My Grandmother used to make them. This giveaway would certainly be that kick in the pants I need. I have sewed very little on and off for years. Recently I went to my sister’s home in another state for one week. She always plans something for us to do. This year we made a rag quilt. Yes, in four day! I have never quilted before. It was fun, easy and very enjoyable to do the quilt. We had a great time! After I finish four quilts for the family, I and another lady will be making quilts for residence at a nursing home where we volunteer. I have a new grand son so I am looking forward to making baby quilts. I also found an adorable pattern for a soft book that I would like to make for him. This year I would like to make more bags and continue to give away quilts to good causes. I’m working up the courage to try paper piecing. I would love to do a bed sized quilt of our beach on Lake Michigan. I would also like to try cats and birds. I am interested in modern quilting, and am looking forward to trying some quilts that are outside my comfort zone right now. I am gonna be making more purses, coasters and baby quilts. I tried to quilt about a decade ago, and although my patchwork was flawless, disaster struck when I tried to quilt my 2nd blanket. So this time, I hope to use some educational aids, and possibly more advanced equipment. I might even join a guild. My hopeful projects for 2016 include the Interweave Dasher Bath Mat, which I think may be small enough for me to have a chance at, and a modern chain link quilt, for which I recently bought the pattern. Before 2016, however, I hope to complete a Christmas stocking for my mom, which I’ve drawn up myself, with pinwheels and four-patch. I managed to find a lovely gold Cotton! At the local fabric store. Hope to make the simplest, easiest, quickest quilt patterns I can find! I just took my first quilting class the beginning of this year, just in time to be able to make my great niece just born a baby quilt. Got hooked on quilting right away. I’ll just be making quilts to learn different techniques with different styles. I’m sure I won’t have any problems finding homes for any of them. This past year I have made several quilts using a different pattern each time in an effort to increase mastering perfect corners! My goal is to make an Amish Sampler Quilt this year along with new quilts for my grandsons new beds. As a new quilter I am looking for all the help I can find. So much so that I even stop women in fabric stores that are looking at quilt fabric and ask them if they quilt, then ask their opinion about quilting. I have become the stoker at our local fabric stores. I would love to find some patterns that represent the slavery years. I have googled and can not really find any. Any help would be greatly appreciated. OK, seriously, any help on any part of quilting would be appreciated. I am looking forward to small projects (table runners, tote bags, mug rugs, wall hangings) that are humorous. I enjoy seeing and making things that make me smile. Wow! Just Wow! 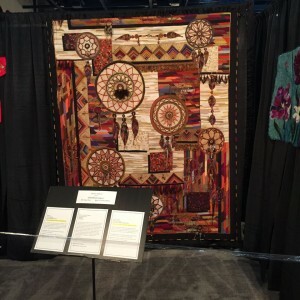 So much detailed and photographic evidence of what you were able to enjoy at this huge extravaganza for quilters. It is glaringly clear how much technology is playing a role in our everyday lives; i.e., cell phones, computers, etc. It’s incredible to see how integral it’s become to the quilting community. Then to bask in the inspirational quilts shown, it truly shows that we are only limited by our imaginations; because the industry is surely allowing us to achieve anything we can think up. Thoroughly enjoyed your blog, thank you so very for sharing so eloquently with the rest of us; hopefully everyone else is as enthused as I am. I must stop buying and reading and start making! A small quilt that does not take loads of time. In my world, that is tops. I enjoy doing things for gifts plus some for me. 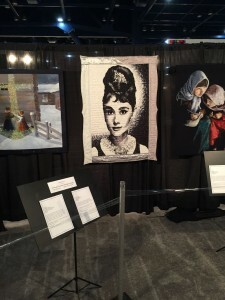 Love all the pictures from your adventure into the international quilting show. I am going to be working on a landscape quilt. The technique is new to me, so wish me luck! I adore the Audrey Hepburn quilt pictured above! I would love to learn that technique as well! I made my first quilt in 2014 and am totally hooked! I am making my 7th one now and it is a quilt-as-you-go with a border. I learn a lot with each one I make. I love your website and all the things I have learned. Keep it up! Still making quilts for my family. For my boys, I want to do something graphic but timeless. Where the color combo will not look really dated or juvenile in 10+ years. Really want to improve my techniques to make a great one for my husband. Will have an oriental theme. Want it to be beautiful but not obvious, more understated as is often the customary. Working on one for my Dad right now. Was going to be for both my parents for their 50th, but my Mom passed away last month. Grateful for the ability to make quilts, and appreciate your professional help! I’m in the process of finishing 3 quilts right now: a baby quilt for my daughter’s friend, a fall themed one, and one made of my grandson’s first year baby clothes. After they are done, I’m going to finish working on a small quilt project that will include paper-piecing, applique and 3-dimenionsal aspects…none of which I’ve done before. I decided to make this to challenge myself to learn new techniques. Since I work part-time in a quilt shop, I always look forward to seeing the new fabrics the owner orders at Houston Market. I am looking forward to making several scrap quilts. I love the idea of using up and creating beautiful quilts. Also I want to challenge myself by making a Judy Nymyer quilt. I love the precision of points that paper piecing achieves and her patterns are stunning. I want to make improvisational quilts of my own design. However, I also bought patterns that I loved and plan to make!!! With every quilt, I begin anew. New patterns, new fabrics, new reasons to make the particular quilt. Always a fresh start from a fresh dream. We all need fresh starts at one time or another. Quilting certainly allows that. I love to quilt. Haven’t been doing it long, but it is so relaxing. I have made 10 rag quilts for my Grandsons. Now I am making quilts for my 2 granddaughters. It is my getaway when I am stressed. I want to make a quilt that requires 1800+ 2 inch squares. And yes, I have surely lost my mind!! I want to try making a big quilt not just baby quilts. I’m nervous but determined! Something simple to start. Wish me luck!! I have to say that I am going to be very conservative with quilting patterns as I am a novice! I think if I can make some EPP hexie squares I will be doing well! But I have plans for a cathedral windown type pattern too! I’m looking forward to making several throws for myself! I’m a new quilter and I’ve made two quilts for my bed (well one and the second one is still in “top only” stage!!) and I’ve made a couple of throws for family members, but none for me! So, that is what I’m looking forward to making! I’m looking for patterns that don’t use TOO small of pieces. Charm pack or bigger even is what I want to make for me. I’m excited because this is a new year and I’ve just started learning how to do free motion quilting. I’m not very good . . . YET! But so far, I love ALL the processes of quilting . . . from the planning stage to the binding stage. Still working a day job . .. but I make as much time as possible! Great weekends are when I can stay home and quilt all day long!! I recently went on a shop hop and purchased all the fabrics I need for a wonderful in-the-hoop machine embroidery appliqué quilt. I looked two years for the misplaced pattern…and like a vision, where I had put it came to me the day before the shop hop! Fate? Yes! So excited. I have a couple of wedding quilts to make this year, along with two 50th birthday quilts for family, so I will stay busy. 🙂 Always look forward to seeing what is new! Thanks for the generous give away opportunity! I love older patterns made easier. I will be making baby quilts and colorful quilts for my family. As I ama beginner I would like to start off with a table runner, then a wall hanging and from there the sky is the limit! Wish me luck! I’m looking forward to making a chevron quilt with colours that I choose. I just started quilting and recently finished a jelly roll baby quilt for my pregnant sister but after making it I realized how much I want to make a quilt for myself! I am a new to quilting and am so excited. My Mother pieced and quilted by hand. She passed away in 2003. I love the vibrant colors and want to piece and quilt the “old” patterns. Wish me luck!! 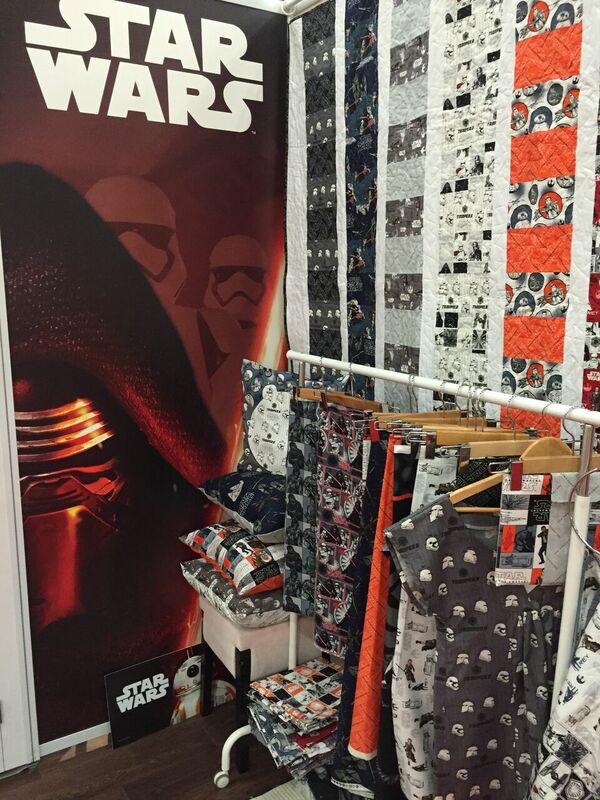 I am looking forward to some Star Wars themed quilting. I would love to learn about more things to sew with hexagons. I haven’t really worked with the, before and they seem to intimidate me. Thanks for the chance to win! I have been sewing since I was a teen. Now that I’m retired I’m happily enveloping quilting. So many beautiful fabrics and amazing quilt designs. I’m still dipping my toes in the water, so I’ll probably stick with some easier designs like 9 patch or maybe a scrappy log cabin. And continue building my fabric stash! I am making gifts for my grandchildren, finishing up a quilt that my mom and I are finishing (it was pieced by my grandma), and some cute wall hangings. I also have to start some graduation quilts. Busy and fun year! In 2016 I want to make a quilt for myself. Mostly everything I do goes to someone (or anyone) else. I want to try my hand at a turquois,red and white color scheme. Top on my bucket list this year is One Block Wonder, put this one off for too many years. I like quilt patterns that look like it took a lot of work/time to do, but it actually didn’t. New techniques in quilting are always fun to learn and do in a quilt. I Love quick easy quilts and anything with houses. I plan to finish a wedding ring quilt that I have begun. This year I want to make more bargello quilts and find some Scrap quilt patterns to use up all my scraps. I also want to make a couple of the Toni Whitney patterns I have had in my collection for a few years. I crochet a lot of blankets for charity and have been learning how to quilt so I can make quilts for kids in need. I love how versatile the Log Cabin pattern is. I plan to learn how to make them, then make some Christmas gifts with them for next year. Hi. Thanks for the lovely photos of all the quilts…gives me inspiration! I am a beginner to the “making” of quilts but a long time lover of them. The work that goes into a quilt is the story that I admire. I am going to try to make both of my sons memory quilts out of their Tshirts from over the years. I am hoping to do a good job at it and have been watching many you tube videos about them. I’m not really sure how to jump in except to just do it. Thanks! I’m new to quilting, but I really want to make a quilt that utilizes hexies. Oh my gosh! So much to do this year! At the very top of my list is making a quilt for my husband. He was complaining last year that I had mad a quilt for everyone except him. I showed him a huge range of quilt pictures, and the one he liked best was the Lone Star with a starburst around it…yea, probably the most difficult he could find. Anyway, after months of talking about it he has finally decided on a color pallet and I should be starting on it as soon as I can get all the fabric together. In the mean time, I have been hard at work making quilted and sewn Christmas presents! 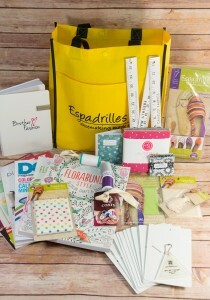 I would seriously love to win this goodie bag! Especially if it has new time saving gagets! I am looking forward to making my first cathedral windows quilt. I remember my Mom/Grandma having one, and I loved it! Someday I will get to Houston….it’s on my bucket list! I have been planning to do a convergence quilt and one of those animal ones with all the florals. Need to finish up what I already started tho. A group of us are going to spend the year doing “Farm Girl Vintage” by Lori Holt. It will be a challenge, however, we are ready for it! So many projects I want to complete and so little time…. I am constantly looking at books on modern and landscape quilting…so have started a landscape quilt but finding it very difficult…will keep plugging away at it…the way to learn. Recently I finished a baby quilt for my new granddaughter and a spooky Halloween quilt with embroidered spiders and webs…both were fun to make. I just love quilting- playing with fabric/colour/texture. Just too much fun!!! I would like to do more scrappy quilts and a one block wonder quilt in the new year. I have beautiful quilts from two generations back. My goal is to become half the quilter my grandmother was so that I can pass quilted love to my grandchildren. I’m planning on making some new quilts for my grandsons that will combine quilting and machine embroidery to create individual interest quilts. I am looking forward to making traditional quilts, I am looking at scrappy quilting it makes me think of the quilts I slept under as a child. I also like to make some to give away, make someone to feel warmed and loved. Happy Quilting. Quilting is my favorite pastime! I plan on making wall hangings for Christmas and a quilts for a friend who is facing a cancer battle. I just finished a very challenging Gypsy Wife quilt. My next project will be something a little easier (but maybe not as fun). I have been accruing vintage handkerchiefs and linens and hope to something really special with them. Also need to finish the Lone Star quilt that my sister-in-law started, then gave to me. I prefer the traditional quilt patterns. This is absolutely lovely! All those items would be a great addition to my slowly growing supplies/stash. My goal is to make a carpenter star for my bed, and a twister because it’s a beautiful pattern. (And whatever other quilts I drool over)! Thank you for the opportunity to win! I would really love to make a pineapple quilt in batiks. I’m making simple patchwork quilts for new two new granddaughters. This year I will try some new jelly roll quilts. I love using traditional patterns and my floral stash of fabrics. I have plans to do a Judy Niemeyer “Summer Solctice” and would love to do my first bargello quilt. I am a beginner quilter. I like to work with easy patterns. I like rail fences, stars I also like to fussy cut childrens themes and work around them. Sorry I couldn’t make the expo it sounds like it was a lot of fun. I have a Star kit that I want to tackle for the new year, love the gray and blue combo. Also always up for wool applique ideas. I look forward to making a quilt for my grand nephew who specifically request a quilt and the colors he wants, pink purple and red in that order with yellow background. He chose a wreath design. Also I have started to draw and design an under the sea quilt and a Spiritual journey quilt…we will see how much gets done. I love looking at all types of patterns and dream of making every one. Realistically, I favor the old simple patterns (log cabin is my all time favorite). I want to try something like the polar bear. I will sew a variety of fabrics together and then cut out an animal shape. I like the elephant and polar bear quilts I see. I love turquoise and will be using it a lot in my quilts in the coming year! I look forward to finishing some older projects and starting some new ones ! I am particularly interested in designing some new bags! I am fairly new to the quilting world. I have been piecing for about a year and a half now and totally hooked. I love reading the blogs, taking classes and seening all the new fabrics and notions. I can’t imagine my life now before I started quilting. I look forward to your newsletters and have added so many quilts/ideas to my to do list that my great, great granddaughter might possibly see the end! LOL since I don’t even have grandchildren yet! I have so many quilts in varying stages of completion, my goal is to finish one before I can start another. So that I can do the new ones I have my eye on I am working on the one that is furthest along (I know, kind of sneaky). Thank you for the opportunity and the inspiration. Can’t wait to make more holiday themed projects this year!! I’m new to quilting so some easy ones for those of us just learning would be nice!! I would love to give a traditional nine patch I can do with my daughter and granddaughters. I have lots of scraps from many projects. Would like to make a quilt from these scraps. I am looking forward to finishing several items this next year. I have a couple of quilt tops, wall-hangings, etc. that have been laying around a little longer than I care to admit. If I manage to finish my undone projects, I am sure to find something wonderful to work on. There are so many beautiful fabrics and patterns that I am sure it will be extremely difficult for me to choose. I want to make a log cabin and a bargello quilt in the next year. I would love to make some vintage quilt patterns and some scrappy ones too! I am a beginner. I have plans for several “quilt as you go” projects over the next few months. The most important thing I have learned so far is if you can imagine it, you can quilt it! I would love to see fabrics that follow the trend among older teens and young adults; cosplay; game of thrones for example. I love the traditional quilt patterns using my own colors. 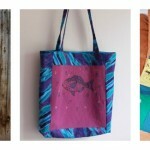 I especially love batiks and bold colors. I enjoy getting wonderful ideas on your website. The patterns and directions are easy to follow too. Thank you for allowing comments for a chance to win a bag. I visited the Houston Quilt event as well. I loved the booths with the 3-yard and 5-yard quilts. I picked up a lot of fabric and look forward to using all my fabric with patterns that utilize only 3 or 5 yards of fabric. Maybe I’ll see some patterns on the Piecing It Together website! i want to make a sun bonnet sue quilt and a farmer sam quilt . my gramdmother made me a sun bonnet sue topper before she died and i would like to finish it and i want to make my nephew a farmer sam quilt for a birthday gift . he comes and watches me sew and loves it . he ask me to teach him to sew and ask me to make him a sewing kit . so i would love to win this great giveaway . i never have won and i enter every give away i can on every craft and sewing site . thanks for the great site ! i learn so much from it ! Traditional patterns with a twist are on my list for the future. With so many pattern options and so many fabrics to choose from it is difficult to decide where to start! Thank you for the chance to win this generous gift pack! I am looking forward to making my first T-Shirt quilt for my youngest son, as well more quilts for a nonprofit quilting ministry that has inspired me to begin quilting this year. In Jan., I plan to take lessons at a nearby shop. I have designed a landscape quilt; I hope to begin it in March. In June, I’d like to learn to do an appliqué quilt. In July, I plan to make more quilt as you go placemats. In Aug., I’d like to start a full size bed quilt for my niece; I haven’t decided on a pattern. Happy quilting everyone! I’ve never done a Crazy Quilt before and I’ve decided on a Victorian Crazy Quilt with pictures. This quilt will be done in memory of my mom who passed away last May. She always loved my quilts and this one is for her…. I’m looking forward to using the apple core and cathedral window patterns, as well as English paper piecing, for some new projects. One quilt I want to make is a Carpenter’s Wheel. My mother made a beautiful one for a granddaughter. Any others that I “may” do, would be simple with pre-cuts. Thanks for including us in your experience. I want to do a pattern with dresden plates. I would like to do an owl baby quilt and I would like to do a fox quilt since I live in Fox Hollow. I would love to win this goody bag, as my retirement doesn’t go very far. THANKS FOR THE OPPORTUNITY. I want to make a star quilt and a double T quilt. I am working on both traditional and art quilts. Learning the art of art quilts has been challenging and fun. I have a potholder that was quilted with a unique “Maple Leaf” pattern. I think that I have found the instructions for it. if the first block turns out well,I may try making a small quilt with that pattern. This year I’m going to get back my quilting groove and work towards a home business. Hopefully I will be able to purchase a long arm with a computer program to do other people’s quilts. I’ve had a midarm for 7 years that I’ve done FMQ on. So time to upgrade and take quilting to another level. Looking forward to making some baby quilts with owls and then more traditional bed quilts but with modern colors. Quilting makes me happy. Now that I am retired, I want to learn more on quilting. I managed to make a quilt-sleeping bag for my grandson this past summer. Now I am anxious to try another quilting project. I always have several ideas on what to make (what quilter does not!?) so sometimes it is hard to choose one. But this year I want to finish up my dinosaurs paper piecing patterns, make quilt using them and incorporate Mister DJ quilt pattern of Melissa Corry from Happy Quilting because pattern seems easy to make and finished product looks elegant and modern. I want to make at least 4 complete quilts. Bold and Bright!!! I was so happy to see Canadians could post a comment, we have a group that has been meeting at the same friends place for the last 23 years, many original designs have come out of this home, and many laughs as well. We never get tired of seeing the same faces every week, to share experience and friendship. I’m looking forward to doing more with embellishments and embroidery in collaboration with my fabrics. Seams as though when I look at patterns and quilts it the simplified, modern and quick quilts I look at more then once. I like the simple lines of quilting. The first of the year will be for me, I want to challenge myself and make a pickle dish or New York Beauty. Then I will hunt up some very fun 30’s reproductions(extremely hard to find up here) and make several small lap quilts for the annual charity stuff a bus and I really want to make a scrappy red and white quilt for quilts of valour, and then, and then, and then. Thank you for supporting and encouraging my addiction. I’m looking forward to making an involved Quilt. One with detail, lots of pieces and lots of modern fabrics. My norm is a simple graphic modern Quilt that works up fast, but I need to step out of my box and work at something with more challenge to it! I plan on making lots of quilts using up my never ending pile of scraps, quick-but complex looking quilts, modern quilts, and many quilts for charity. Thanks for this great give-away! I am going to try and create a pineapple block quilt. You have a great job. Thank you for the giveaway. Looking forward to finding interesting ideas from new fabric, ie. Computer generated, and new patterns that were debuted at market and show since its on my bucket list to attend. Hoping! I haven’t been quilting very long, and I’m almost 70 yr. old. Have stayed with safe (read easy) quilts, would like to try something to stretch my skills. Thank you! I was blessed this year with my first grandchild and although a very new quilter, my first project will be a T shirt quilt from some of his outgrown clothes!! I just want to learn to quilt better and to finish a quilt. Have been doing a lot of church work for a while, but love to quilt when I have time. Have done a Bear Paw wall hanging, which my sister has, some paper pieced pot holders, and other small blocks. etc.,for Charm/Friends quilts. Did some hand-pieced/appliqued Christmas Decorations. Love to do the hand work also. That you can always take with you wherever you go. Will be finishing my last term in October, 2016, and intend to get further into quilting as soon as I can. My stash keeps growing all by itself! I’ll have to catch up on all the new techniques and tools – really looking forward to that since I haven’t quilted for about 10 years. Will try for some on-line classes and reading, reading, reading! Want to do a denim patchwork-type picnic quilt as a starter, then a landscape for my single bed. This will be the first thing I will be keeping, all others have been given away. I’m still sort of a newbie quilter and I have a wishlist. I want to do a carpenter’s star quilt, would love an Irish Chain in 2 colors this year, a ginormous king for our bed (still trying to decide on pattern). I just got a long arm frame and mid arm machine so I want to practice, practice, so I’m up for about anything at this time. I am a handquilter and with all of these new fabrics and designs all I can say is that I will be quilting long after my ashes are spread. As much as I love to start any new quilt, my goal this year is to finish some of the many I have started. I want to me at least 2 quilts this year – a nautical foe my husband & I was given a Free Spirit Triple Barn Star quilt kit. Love being able to show my love thru my quilts. I am planning on making some baby quilts for my next grand-baby. I haven’t picked out just which ones yet though. I live on a sailboat full-time and I quilt! I want patterns that can be done in small places, where I cannot leave stuff out until the next time I get to work on them.. I have no design wall, no in-table machine, no big stock of tools. I have limited stocks of fabric and thread. BUT, I have time to do complicated thing that can be joined together for larger things, I have no room for art, but utility things are great. These are the types of projects I want to see. I would love to create a quilt who will emphasise the need to protect and love our planet for future generations! I’m going to finally sew my first quilt! I’ve got the fabric and the machine. I’ve just joined this site. It’s time to get started! My oldest is a senior in high school and in his last year of band. He has dedicated himself to band since he was in the 4th grade where he taught himself to play the trumpet. I am going to make a music quilt for him full of trumpets and notes along with the high schools mascot embroidered on the corner of the quilt. I am very excited to see how this will turn out and send him on his way to college “hugged” by his quilt. I would like to try English paper piecing this winter, it looks like fun. I am new to quilting. I enjoy the learning experience. There are so many wonderful quilts to explore and maybe someday try. It looks like there are so many more tools out there to try than what my neighbor had to use and she was an master at quilting, I cant imagine what she would and could have done with some of the new tools. Just finished 10 Less than Traditional quilts as Christmas presents for my kids and grandkids, had alot of left overs from the squares and I plan to make some throw quilts with thise left overs. I am making three scrap quilt for my brother’s new cabin in the mountains. I love all of the beautiful booths. I think I will make a quilt out of some of the Morningside Farm fabrics, but I do love the elephant fabrics for a grandson. Thank you for the photos. I enjoy making quilts that go together quickly but look as though you spent loads of time. Plus, I have many, many UFOs to work on next year. Paper piecing is on my list for the near future. Thank you for the chance to won. I hope to make a couple I spy quilts for baby gifts this winter. Also, bought the triangle quilt kit from Keepsake Quilting and some UFOs. I am attending the Quilter’s Quest around the D.C. area, so I will be looking for patterns using the exclusive 10″ squares from our tour. Love the Kaffe Fassett fabrics and seem to be leaning more toward modern quilt patterns lately. Just really like to see the fabulous ideas that others bring to the table, even old patterns are new with a funky fabric! I’m looking forward to making all kinds of different quilting patterns this year. I am currently doing some applique with added thread embellishment to them. I like all kinds of quilting so hope to branch out into ones I haven’t tried yet. I just got a book on Bargello and one on round quilts I can’t wait to try. I just purchased a sweet 16 sit down machine and I am going to quilt the tops I have. Its going to be a fun time. I love quilting and making tops and pillow cases. I have lots of small quilts and wall hangings planned that will improve my piecing and free motion quilting techniques. Thank you for the generous give-away. I would like to make a tumbling block quilt. I can’t wait to work more with precuts. Love to be able to use all the fabrics in a line of fabric. I’m going to sew for charity,i also will be teaching my granddaughters to quilt,i’m on the teach what you know soapbox! i feel so blessed,i want to give back!!!! I am looking forward to making quilts that are at least partially paper pieced (maybe with a big focus block) and at least somewhat scrappy. I like to have lots of interesting fabrics to look at in a quilt. I love stars. I would like to make a couple of paper-pieced star quilts. I also love making flying geese I think they look great in borders as well as being the star of the quilt!! I have a lot of quilts that I should be finishing, but instead I would like to start new ones, mostly with house, tree or bird themes, because those are what seems to speak to me. I sure would love to win that swag bag! I want to make a quilt for my husband. A Man Quilt that he can put in our camper. I HAVE MADE SMALL QUILTS FOR DOLLS . GRANDMA TAUGHT ME HOWTO QUILT IN MY 20’s. NOW I AM TRYING A BABY QUILT. I’m in my 60s. I would like something unique but pretty simple and quick to make in bright colors. I hope also to get some of my many UFO’s finished this year that now reside in our unused bathtub. 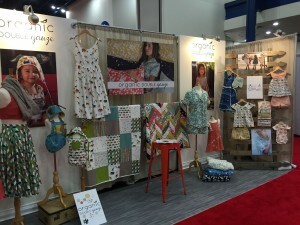 Loved the Houston Quilt Show pictures and the new fabrics that are coming out. I am looking forward to making a couple of modern patterns as well as the farmers wife – depression era – sampler quilt. i am new to quilting. I lvoe the various patterns available. I’m thinking I start small and maybe do a lap quilt to start. Looking forward to making a tumbling block quilt. Been many, many years since I made one. I am going to make a flower quilt for my granddaughter and have a couple of scrap quilts planned! We are expecting our first grandchild this Spring so I would like to make baby quilts with a more Modern flare with less traditional colors. Thank you for the peek of the Quilt Market, it looks like it would be so….. I want to make 10 baby quilts filled with love and warmth and interesting fabric patterns. These will all be for a missions project. The warmth and interesting fabric patterns comes from the inspiration for the quilts and I add the love through my joy and addiction to quilting. Since I am new to quilting, the new year will find me trying my hand at Jellyroll quilting and free motion quilting. I also want to be able to attend some quilt fairs and perhaps Quilt market 2016. I am looking forward to actually sewing up two of my own original designs, one will be a mystery quilt next year. I’d love to win the fantastic swag bag! A crazy quilt for myself and as many children’s quilts for an adoption agency my niece works for. In between that and my knitting and crocheting, I plan to make a couple of quilts for a shelter! Well i know i dont qualify as i dont live in the U.S but my next job is a rememberance quilt for my new grandson. I am keeping special clothes and going to Make it up like appliqué. I would really like to make a quilt in red, black, and grey, just not sure which pattern I am going to use. Also will be making more baby quilts for family and friends. I love to sew ,but sometimes life just gets in the way. Thanks for offering such a great giveaway. I plan to complete the Paint Chip Challenge quilt from our guild. Think I have finally decided on the pattern. My colors are red and blue. I am looking forward to doing a rag quilt and a disappearing four patch. I want to make simple stash busting quilts. I am new to quilting. Have made 1 simple baby quilt. Am hooked. My mother made lots of quilts. Want to follow her footstrps….want to make a batik lonestar quilt, mariners compass quilt and new York beauty quilt. I have so many different patterns and tutorials I bookmark and save for quilts that I want to make. I just need to find the time to try them all. But I am going to try my hardest. My priority will be to make a patriotic quilt for my daughter-in-law to raffle at her annual fundraiser for the Horses for Heroes program that she is the founder of. i am relatively new to quilting, recently retired and always admired my Mom’s hand made quilts. Just finishing a Double Wedding Ring Queen sized quilt for one of our daughters,not hand quilted but still a challenge. Really enjoyed your great pics of the “Eye Candy” at the show. I would love to work with new fabrics and tools. Making a patriotic quilt to benefit “Horses for Heroes” program founded be my daughter -in-law. I plan to make bright scrappy quilts next year. I like the traditional quilts like the log cabin, carpenter star,or the lone star,but have to use my stash and scraps. I am looking forward to learn how to make some of the older traditional quilts, but with some of the new bright & bold colors. I really enjoy all of your quilts & your how you can make this too. Thanks for all the hard work you guys do,, so we can learn & enjoy Quilts of our own. I am new to quilting. I am as excited to see what I end up doing as anybody! I am just learning to quilt. I would love to be able to make a different kind for each of my 4 grand children. They range in age from 1 to 16. Jelly roll, fat quarter, layer cake, and what ever else there is available. I think I can do the tops, it’s the backings and especially the quilting part I really need to learn so much about. I’m going to concentrate on perfecting my paper-piecing skills. I have made 3 necessary clutch wallets in the last two weeks and am making 5 more all for Christmas presents. I think I’m hooked! I’m also planning on making 3 Christmas tree skirts for my children. Quilt Market sounds awesome! Most of the quilts I make are for the males in my family-no flowers, fairly simple patterns. With my 1st grandchild due to make an entrance in December I am looking forward to making baby quilts, especially with some of the more modern color schemes and a modern quilt pattern. I make a lot of baby quilts for charity using pre-cuts and scraps. I am looking forward to using up what I have and trying out new patterns. I am most excited about making a Bible verse quilt and a minky quilt for my new grandson who will be here in February. Gotta get busy! I plan to make table toppers using a lot of my scraps. I have two major plans for 2016 – make a quilt with small-sized animals for my GreatGrandson’s twin-sized bed (a major undertaking for me) and I love to do the very small paper pieced wall hangings for gifts. Winning your wonderful basket of goodies would be quite a “shot in the arm”! I want to try more traditional patterns using lots of scraps. And I want to try some feathered star patterns – also scrappy. Would love to have been there at Guilt week, maybe one of these years. I just retired so I am excited to devote a lot of time to quilting! There are so many patterns I want to try! I get a lot of inspiration from your site. A trip to Quilt Market is on my bucket list! I will be working on a crumb quilt and maybe something simple with big pieces so it will get done. A pile of goodies might distract me from quilting for a little while, but I can use the break anytime! Thanks for the chance at the goodies. I love your sites. i’m so inspired and want to try paper piecing and the Mariner’s Compass and hexies might be the ones to try. thanks so much for offering this prize to a lucky winner. From now on I am just going to make quilts that make me happy. I plan on just doing it. No more fear or worry getting me down. I plan to make a Star Wars quilt for my husband after I finish a hearts quilt for a good friend who is having open heart surgery. She will need something to snuggle with while she is healing. I am retired and make mostly baby and kids quilts for donation locally. I’m trying to use as much of my stash fabric as I can. I would love to go to the Houston show again. I went to one early on in their history and so enjoyed it. I would like to make quilts like Sheila Frampton-Cooper. Colorful and freely creative…a little more abstract and unbalanced. I am looking forward to making more paper piece quilts. I am a perfectionist so naturally I would love paper piecing. Since i’ll be teaching it starting in January, I am hoping to be able to personally focus on it more as I teach. I only make charity quilt tops, over 100 so far this year. They are finished and tied at my church. 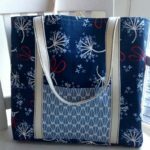 I’m always looking for charity patterns that are quick and easy to make with all of the different kinds of donated material we receive. Big pieces, small pieces, you name it! Plus, it’s all about the love that is put into a charity quilt. Creative quilt backs. I love the surprise of seeing a small amount of piecing on the back of a quilt. So many wonderful quilt top patterns to choose from but the LARGE open space of the back is screaming for some attention. Soooo for inspiration I would really like to see some ideas for piecing the backs. This year my quilt list includes one spool quilt, one French braid, one cow (moody brews) and two nine patch. Thank you for the opportunity to win. I’m very new to quilting so I have SSSSOOOO many ideas and patterns I want to try!!! I’m excited to get started on this new creative endeavor! By the time in done everyone in my family will have at least 1 quilt made with love by me!!!! I have just gotten into quilting, and so far been making my own designs up as I go. I always do a few hand embroidered panels for each theme and quilt I make. I am now ready to try out some of the more traditional versions. Log Cabin and Double Wedding Ring are on my list for right away… P.S. I love the info from you site and really enjoy the comments from others!!! Happy Holidays Everyone!!! I have a butterfly quilt, a Sunbonnet Sue, and a Mariners Compass in the works to finish this year. I am looking forward to making a paper pieced wall hanging that my daughter and I designed. We have to finish breaking down the pattern at large to manageable sizes to paper piece. She is working on that while I finish my Christmas projects. I am making a quilted table topper and fabric coasters to give to a charity auction. I make other quilt projects and give them away. Since we are expecting our first great grandchild 12/24/15, I am starting to make baby quilts, burp cloths, receiving blankets, etc. I would like to complete a quilt for each of my Grandchildren that shows their likes and personalities. I have an Owl quilt that is started that I want to finish. And a Judy Niemayer (sorry for the misspelling) that I want to get done and whatever else that strikes my fancy. Double wedding ring! Rust background with patel pieced rings. Have planned this quilt and collected the fabrics and now I need to finish my applique rose quilt and then i’m ready to star. I hope to finish the queen size sampler quilt for my bed. I started it two years ago and now that the youngest grandchild I care for is in full day kindergarten, I hope to get out my quilt and get busy! This winter I want to make a couple of flannel baby quilts using my Quilting Magazines for inspiration. I am just getting into quilting and I love it! I have a lot of my grandmothers and mothers fabric that I would love to make into scrappy quilts. Thank you for this opportunity to win this great package! Working on a log cabin quilt at present, but want to do a disappearing nine patch next. Thank you for this chance to win a great prize. techniques. I really like paper piecing and am making several Christmas gifts. Hope to make some things for my home in 2016. I make a lot of simple baby blankets for charity, but 2016 will bring a new adventure. I will be teachiing a beginners quilting class at my kids private school. It will be a small group of high schoolers and I’ll be able to use up some of my ever growing stash. We’ll be starting out very simple so probably 4 patch or 9 patch blocks made into potholders. I’m currently teaching a beginners sewing class and some of the same girls will be in the quilting class. Thank you for the chance to win! This year I am going to try to finish all the beautiful quilts I have started — all 12 of them. I like to hand quilt all of my quilts — that’s why I’m a little behind. Going to a Quilt Show in Tucson, AZ this weekend — so excited — love Quilt Shows!!!! I am so excited to see all of the Native American designs and patterns. I can’t wait to see them in my local store. 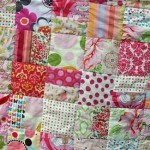 Love the bright quilts made with pre cuts. Love the Fave web site have gotten so many ideals of quilts I would love to make, how does the saying go so much to make and so little time. Thanks for the chance at the gift bag. I cannot believe the number of “owl-ie” quilts available. 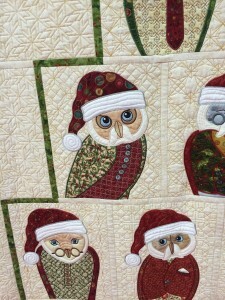 I love owls…and will certainly be amking an owl quilt in 2016. Thanks!!! I recently retired and wanted to learn to quilt. So I took a beginner’s quilting course and I am hooked. I think I can honestly say I am collecting fabric as my new passion. I just cannot get enough of it – sort of like an addiction. So far I have made a lap quilt and two table runners. So I am looking forward to making a baby quilt for my new granddaughter – something in a very modern style with pinks and greys. My daughter has also approached me to teach her to sew so this is going to be a great retirement. I plan to make a Celtic quilt for my oldest son and a quilt of valor for my younger son. These will be my first quilts. Thanks! I will be looking for patterns that use bali pops or jelly rolls. Also, any pattern that reduces my scrap bin is an instant hit. why only open to US and Canada? I am an avid fan of this site and I live in UK! So glad to hear you’re a fan! Unfortunately due to government regulations, we’re only allowed to host giveaways that ship to the US and Canada at the moment. We’re currently looking into other ways we might be able to give back to our international readers. We hope you continue to check back for more quilting and sewing projects! Thanks for explaining. I love this site and always go to it for new ideas. I am so new to quilting. I’ve been spending so much time on-line jumping between quilting sites and you tube videos, My house in a wreck and my brain is in a fog. I feel like a too wet sponge-dripping with ideas. My rotary cutter has a new blade and while I am feeling a little less sharp than my blade, I am jumping in and starting with some easier log cabin designs. I’ll let you know how I do! Thanks for all the quilting help. I have been collecting beautiful fabric for a while and will soon begin quilting (I recently retired). I love trade shows and all of the fantastic ideas that they can foster. Quilts for my grandkids in their favourite colours that are user-friendly: cozy and of course washable. Possibly some quilt as you go. Also I want to make table runners as gifts. I’d like to make minis that could be changed seasonally or monthly; also trying EPP for the first time! I love the look of applique, and have done some in the past. I would like to become more comfortable doing it. I plan to take some classes and practice. There are several other techniques I want to learn so that I can spread my quilting wings. I am working on some paper pieced pillows…what fun and wonderful to take along on road trips! i would like to make an extra special quilt for my daughter and fiancé as a wedding gift. I don’t have a long arm machine but if I have patience i believe I will be able to sew and quilt it at home on my Laura Ashley by Brother machine. She is our baby out of 8 children so I want the quilt to be full of love and happiness for their future. I am hoping to win the gifting as it would help me accomplish this goal. I love mystery quilts but will be working with my mom for a while to completing a double wedding ring quilt for my daughter and her husband-to-be….the wedding is in July! Would love to make ared, white and blue quilt. Love those colors! I’m revisiting my UFO’S, finishing a BOM and challenging myself to use neutrals/ tapes or grey colors in a quilt. (I usually do bright colors). Oh yes, tools! Got to check out new gadgets and tools! I have so many quilts I want to finish. I just retired and thought I would have tons of time but I have so many ideas and plans I’ll have to live to 100 to make them all. Sew much fun. Could spend days looking at all the goodies. 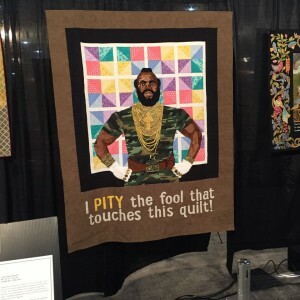 I had a wonderful time at the quilt show this year! I have some many ideas for quilts that I would love to make. I am going to work on my applique and make something special for my new little granddaughter. I am new to quilting so I am still working on my first quilt. I am so overwelmed as what to do!!! I want to piece and continue getting better at quilting. I love to learn and try new things. Sewing for myself as well as for craft fairs in the coming year. Learning and Practicing the new skills I learn are important to me. Learning something new keeps me sewing and my creative juices flowing as I improve. I am working on my first applique quilted wall hangings for my kids and their spouses. So far, it’s been a lot of fun!! Just starting to quilt. Love the patterns and looking forward to making quilts for my grandchildren. Already made 2 for my granddaughters. Only 6 more to go! I will just be looking forward to having more personal time to quilt. I have a graduation and new baby quilt to make. The graduation quilt will be made out of Zen Chic’s Ink & Paper line. I can hardly wait to get started. Am new to quilting and have tried several small pieces. now ready to do larger projects. Log cabin and rail fences look fun and challenging to me. Might try one of those rage quilts too. Thanks for all the info, pictures and support you send! I enjoy quilting and looking for new ideas all the time, I want to made all of mine 9 grandchildren a quilts when that older to enjoy and use them without putting crayon and marker marked on them . I am new to quilting and fell to n love with it. Every piece of fabric now has a new meaning for me and I love making baby quilts. Expecting a new grandchild and she already has four quilts to her name and she is not even here yet. Now my other two granddaughters are clamouring for their own. This year I will attempt a double bed size quilt for my university bound granddaughter and a light sleeping quilt for my eight year old. No piece of fabric, big or small get thrown out in my household. I just wish I had a quilting machine as I am not to experienced with freehand. Always searching for quilt patterns of any quilting level to make into a Quilt of Valor for our military service warriors. I am looking forward to making traditional and original design quilts; I have an idea for a NASCAR quilt for my husband! Am new to quilting and have tried some small pieces. I think I’m now ready to do larger projects using jelly rolls or maybe piece work using embroidered blocks. They look fun and would probably be quite challenging. Thanks for all the info, pictures and ideas. I am a beginning quilter and am very excited to finish my first project which is a baby quilt for my new granddaughter. I have started to design some quilts that will be a series based on my world travels. I have plans to make simple colorful quilts to give to the homeless in our area. I am making a quilt for my grandson for his college dorm using fabric with the college logo on it. I love to personalize my quilt projects to fit the person. My goal is to QUILT 1/4 of the quilt tops hanging in the To-Do closet and finish one of the 7 WIPs in the sewing room. My hope to restrict the number of new projects to less than 8 in 2016. My dream is to create 2 new designs and begin the construction of them within 8 months. 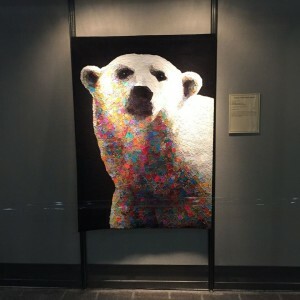 Of all the quilts I saw last week “in Houston”, I think the most original was the collection of knitted pieces incorporated into wall hanging quilts and embellished with everything from beads and buttons to chips of crockery. Totally unexpected. Completely original. Great photos! My next quilt will be for my daughter with a simple pattern I came up with – plus some applique. Probably before then I’ll be sewing some girls dresses for Christmas! I hope to make quilts with simple designs and great color combos this next year. Thank you for sharing your photos of the exhibit. 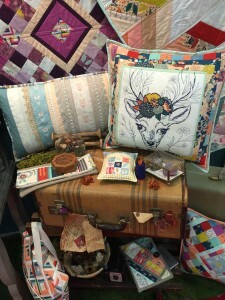 There is always so much inspiration from seeing what other quilters are making, and the new products available. I would have enjoyed testing out the quilt machines/frames in person if I had been there. I am busy now working on Christmas gifts. I happened across this post via Pinterest in my search for an easy and modern quilt pattern for a special newborn baby girl. I purchased a new machine recently that is a quilting sewing machine (with a large attachable bed, quilting feet, everything…) and I will be attempting my very first quilt ever! I have been reading and watching tutorials over recent months out of curiosity for quilting, which in turn led me here thinking I would learn anything I missed, or even as a refresher. I learned so much more than I expected as far as the advanced technology that has bled into the crafting/sewing/quilting world! I also learned that this sewing/quilting community is so down to earth and ‘real’ across the board! Thank you for sharing your experience and some behind the scenes stuff! I’m super excited to begin my journey learning new things and being surrounded by such awesome people (virtually )!!! I am a seasoned sewist, but somehow I’ve never quilted. I am starting this year by attempting to make a quilt from my late sons dress shirts. I plan on making a medallion quilt using my stash of reproduction fabrics. I am a member of a large quilting group and we make Quilts of Valor and charity quilts. I have finished 11 quilts for charity since May and I hope to make even more quilts next year! I am looking for patterns I can share with my quilt group that are easy and fun to make. We have turned out some fantastic quilts so far and hope to do many more! As a fairly new quilter, I am first going to make a crib quilt for my good friends baby girl. I was thinking about a type of flower or leaf block. I think next a fall coloured wall hanging using leave blocks, and maybe pumpkins. I love nature designs! 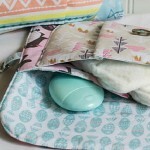 I’m looking to make some quilted bags and a baby quilt. Last Christmas I made several memory quilts and pillows and gave them to family. I’m fairly new to quilting so want something fairly easy. My projects for 2016 include the gift quilt made from the chocoholic line and a black and white themed quilt . I also have several kits waiting to be put together. I love quilting and once I start, I just hate to quit. I really enjoy this website and all the ideas that inspire me. Keep up the good work. I am going to finish my Underground Railway quilt as a bedspread . Just did my first Shop Hop! I have several row by rows to make. Even bought material to make quilts for two great grand daughters and bought several panels to set my creative juices flowing. I would love the learn and take a class on how to quilt and I’m not sure the sewing machine I have is capable. For me something simple to start with. Stars, HST, log cabin, rainbow, strip piecing and whatever my grand daughters want to make. So much fun. Thanks. Am looking forward to creating a few of my own designs in the coming months. I like scrap quilts best but also ones that tell a story. I have donated in the past and these will most likely go to a foster care home and/or an abused women’s shelter. I am an elephant-loving quilter. This year I want to make two bed quilts, one with elephants and one very traditional, using blue, yellow and white. And I want to experiment with multi-media quilted wall-hangings. So many projects, so little time…..
I’m hoping to make lots of quilts for my Guild’s charity projects. I have lots of scraps to use up before I start making more. Should keep me busy while the snow flies here near Buffalo. 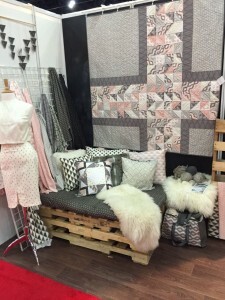 Love your coverage of the Quilt Market! My quilting goals include an English paper piecing project using 1″ Hexies, and finally making T-shirt quilts for my college daughters! Finishing up a peacock French braid, king size. Next up is a Sundance Star for my sweetie. Then I have some beautiful Asian prints with metallic accents, not sure what to make of them. And finally, a landscape with textured fabric manipulations, paper piecing, and beading. Plus the usual monthly pediatric cancer patient quilts for my guild’s project, baby quilts for all the new family babies, birthday quilts for a dozen grand and great grand kids, and table top runners, mats, etc., for wedding gifts, adult birthdays, and so on and sew on. I am recently retired and have a limited income, so I am always looking for ways to use the fabric in my stash, thus minimizing the cost. Would love to see more ideas for stash buster projects. I am looking forward to paper piecing. Took a basic class this year and we did a small paper pieced block. I couldn’t wait to get home to make more. I also would like to do more and learn more of the free motion. Love it ! There are so many options with free motion, you are only limited by your own imagination . I have 2 quilt blankets in mind. First I can’t wait to tackle the Family Tree Blanket. Second, I have forever wanted to make a large Star Blanket. I quit for a while but I think its time to put my foot on the pedal and see what comes about. I have been getting tutorials on different stitches and star sewing. Hope to get these done in the next 6 months. In need of fabric, can’t leave home, medical reasons. I live alone and looking for something to occupy my time. thank you for this chance to win your package. I love small projects such as wearables, vest , houseshoes, and accessories for myself a new bag or for my home a new potholder. I am always on the lookout for new methods and patterns. Thanks for the chance to win. I like to make patterns that interest the person receiving the quilt. I have never boughten a quilt pattern but would like to this year!!!!! I have a nerve disorder that is getting really bad an I pray it doesn’t take that away like everything else it has destroyed!!! Thanks for the chance to win. I just learned how to quilt last month and I am totally addicted. I love matching fabrics and playing around with the design layout. Why did I wait so long!!!! 12 Days of Christmas: Day 12!